A posting on a local online forum alerted me to the fact that a Brown Pelican showed up on a small pond (approximately 2 acres) in my hometown of Maricopa, AZ. 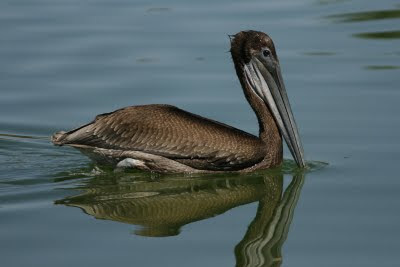 Brown Pelicans aren't extremely rare in Arizona, though they are uncommon. Unlike White Pelicans, Brown Pelicans infrequently leave coastal areas, and tend to like deeper water where they can fish by diving head first from the air. It is a little odd that this pelican showed up so far inland on such a small pond. 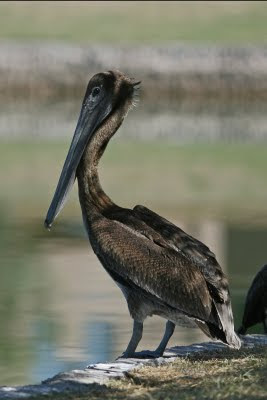 There have been several cases of western Brown Pelicans becoming disoriented and ending up in places they typically don't inhabit. This made the news quite a bit in 2008 and early 2009, where cases of Brown Pelicans walking onto busy freeways, hitting boats, and one case where a bird ended up on a snow covered peak highlighted the issue. This bird in Maricopa appeared in good health. It flew around the park one a couple of occasions, and actively swam in the water. It didn't demonstrate any abnormal behavior that I could discern, though I'm not an expert. The park where the pelican was seen (Pacana Park) is less than three years old, and I typically don't search for interesting birds at it. The vegetation is young and the lake is small, though it is stocked with fish. Other interesting birds seen at the park while the Pelican was there included Green Heron and a Neotropic Cormorant. Driving by in the past I've seen Great Blue Heron and Great Egret. Thanks for blogging about the pelican! I was driving by yesterday and caught of glimpse of "Bob" (as my kids have dubbed him?...her?) and did a double take. I'm from Oregon and was very used to seeing White and Brown Pelicans there in large groups but have never seen one hanging out alone...in the middle of the desert! I feel sorry for Bob. :( BUT one of the young cormorants has taken a liking to him and they are keeping each other company much of time! Great educational opportunity for my young kids. We wondered about thish pelican as well. I wonder how it made it all the way out here. Oh well...maybe we should make him our mascot.